Copyright: © 2018 Li KN, et al. This is an open-access article distributed under the terms of the Creative Commons Attribution License, which permits unrestricted use, distribution, and reproduction in any medium, provided the original author and source are credited. Background: Based on the theoretical basis of the pathological mechanism of cerebral ischemic injury, from the molecular level, using PC12 cells in vitro cell model pharmacodynamics and PK-PD correlation model research, to explain NaomaitongNMTpharmacodynamic material basis for the treatment of cerebral ischemic injury. Methods: Four in vitro cell models of cerebral ischemic injury were established. The side-leakage of lactate dehydrogenase (LDH) and NO content were used as pharmacodynamic indicators to establish the corresponding drug-time curves of NMT and each single-drug; Based on the SVM algorithm, a PK-PD correlation mathematical model was established. Results: The cerebral ischemia model caused by NMT has obvious protective effects compared with each single herb. Each single herb has different protective effects on the four damage mechanisms. The protective effect of Radix Pueraria(RP) was stronger in cerebral ischemic injury induced by Glu, In the cerebral ischemic injury caused by calcium overload mechanism, the protective effect of Ligusticum chuanxiongLCwas greater than that of Panax Ginseng(PG) and RP. The 15 components in NMT contained drug serum had a certain correlation with the cell injury model caused by the four mechanisms. It may be a medicinal material for NMT, and the different components have different correlations for cerebral ischemia damage caused by different mechanisms, and each component also has different efficacy. Conclusions: It reveals the medicinal substance basis of NMT in treating cerebral ischemia,and provides reference for the clinical rational use of NMT for the treatment of cerebral ischemic injury, and provides guidance for the basic research on the substance of traditional Chinese medicine. Naomaitong is a clinical experience in the treatment of ischemic stroke, consisting of Radix et Rhizoma Rhei(RR), Panax Ginseng(PG), Ligustici Chuanxiong (LC) and Radix Pueraria (RP). The mechanisms of cerebral ischemic injury include excitatory amino acids, calcium overload, excitatory amino acid toxicity, NO, oxygen free radical damage, inflammatory reaction, energy failure and apoptosis, etc . However, the substance basis for the treatment of cerebral ischemic injury is not yet clear, and because of the characteristics of multiple components  multiple targets, and multiple pathways of traditional Chinese medicine compound formulas, the difficulties in the basic research of NMT effective substances are increased [3,4]. Therefore, establishing a scientific research method suitable for the complex system of traditional Chinese medicine and clarifying the material basis of NMT is the key to study the effect of NMT on cerebral ischemia injury . PC12 cells are derived from rat adrenal pheochromocytoma cell lines. Their cell morphology and function are close to neurons. It is currently an internationally recognized model for studying neurobiological, neurochemical and neurological diseases in vitro . It is also the most common cell line for the study of neurotoxicity and is widely used in vitro studies of neurological diseases . The four commonly used in vitro models cover four important steps of the cascade reaction during cerebral ischemia . The model of re-irrigation after hypoxia-glucose deprivation was the initial injury process, and the injury model of glutamate, potassium chloride and hydrogen peroxide were the most serious three-step process leading to cerebral ischemic injury . The model was in line with the theory of cerebral ischemic injury. Has a certain theoretical basis . LDH (lactate dehydrogenase) is a key enzyme in the energy metabolism process in the body and is present in all cells . It is a stable cytoplasmic enzyme. When the cell membrane is damaged, it is quickly released into the cell culture fluid and detected in the cell supernatant . The side leakage of LDH can reflect the extent of cell damage . Cerebral ischemia stimulates nitric oxide synthase (NOS) and induces the production of large amounts of NO . In particular, during reperfusion, it stimulates nerve endings to release large amounts of glutamate and activates the receptor of N-methyl-Daspartate (NMDA), the Ca2+ channel on the cell membrane is activated , so that a large number of Ca2+ enters the membrane from outside the cell membrane , leading to an increase of the intracellular Ca2+ concentration, activating NOS activity, increasing the amount of NO production , and a large amount of NO may cause neurotoxicity, thereby leading to cells Damage or death, determination of NO content can reflect the extent of nerve cell damage . Support vector machine (SVM) algorithm is a new machine learning method proposed by Vapnik based on statistical learning theory . The algorithm is a convex optimization problem, which accords with the principle of minimizing structural risks and converts the problem of solution to two . The problem of solving the problem is converted into a quadratic optimization problem, so that the SVM converges to the global optimal solution of the problem and prevents overlearning . Its greatest feature is that its generalization ability is relatively strong, that is, a small error from a limited training set sample can still guarantee a small error to an independent test set. Siera et al. established a compound neurotoxicity discriminant model using SVM to investigate the neurotoxic components of Shandou root. As a result, 13 potential neurotoxic components were obtained, of which 4 components have been reported in the literature. Qu et al. established the anti-hypoxic effective site of Xiangdan injection by establishing the SVM prediction model of compound drug efficacy. and the results showed that the efficacy of multiple compatibility groups was superior to that of the whole party. Therefore, in this paper, LDH side leakage and NO content of four kinds of damaged cells were used as efficacy indicators to study the drug-time curves of NMT and each single drug in PC12 cells at different time points. Meanwhile combined with previous pharmacokinetics. The data was analyzed by SVM algorithm to establish a PK-PD correlation mathematical model. The correlation between the plasma concentration, time, and efficacy of blood components of brain injury in different injury models was analyzed to elucidate the therapeutic effect of NMT on cerebral ischemia injury. PC12 cell provided by Shanghai Institute for biological Cell Research; DMEM, DMEM without sugar, fetal bovine serum, trypsin, penicillin-streptomycin solution (GIBCO); sodium dithionate, potassium chloride, glutamic acid, hydrogen peroxide (Tianjin Zhiyuan Chemical Reagent Co., Ltd.); Healthy male SD rats, SPF grade, weighing 220-280g, provided by Experimental Animal Center of Guangzhou University of Traditional Chinese Medicine, license: SCXK (Guangdong) 2013-0034. All medicinal materials were purchased from the market of Chinese herbal medicines in Bozhou, Anhui; Lactate dehydrogenase (LDH) test kits and Nitric Oxide (NO) test kits (Nanjing Jiancheng Bioengineering Institute); all reagents were of analytical grade. According to NMT, a certain amount of each single herb was weighed, plus 10 times of 60% ethanol reflux extraction twice, each time 1 h, filtering, merging the filtrate, by rotary evaporation instrument to concentrate without alcohol taste, add distilled water constant volume 0.5 g/ml of liquids, stored in 4°C until used. 30 healthy male SD rats weighing 280 ± 20 g were bred for 1 week. Weighed rats were randomly divided into 5 groups, NMTPGLCRP, 6 in each group, according to NMT and single herb liquid /12 g/Kg gavage, respectively. 12h before administration, fasting was not allowed, water was taken, and blank serum was taken 1 hour before administration. Eyelids were used 5 min, 15 min, 30 min, 45 min, 1h, 1.5h, 2h, 4h, 6h, 8h, 12h, 24h after administration. After standing in a refrigerator at 4°C for 2 hours, centrifugation was performed at 4000 rpm/min for 10 min. The serum of the same group of rats was centrifuged and mixed. After being inactivated by a 56°C water bath for 30 min, the solution was filtered through a 0.22μm microporous membrane to sterilizing, stored in -80°C until used. PC12 cells were seeded in 25 cm2 polystyrene flasks with 4.5 g/l glucose in DMEM medium, containing 10% FBS, 100 U/ml penicillin, and 100μg/ml streptomycin. Cells were incubated at 37°C under a humidified atmosphere of 95% air and 5% CO2 . After PND 21, all offspring mice were weighed, and sacrificed via cervical dislocation, and brains were quickly removed, weighed, and stored in a nitrogen canister before use, except those for Golgi-Cox staining. After weighing the body and brains, the coefficients of brain mass to BW were calculated as the ratio of brain (wet weight, mg) to BW (g). Hippocampi were dissected from brains and frozen at −80°C. Every effort was made to minimize animal suffering. After the cells were in the logarithmic growth phase, the cell density was 105 cells/ml, inoculated in 24 well plates, 1 ml/well , they were divided into blank serum control group, model control group, NMT and each single herb-containing serum group with different blood collection time. The blank serum control group and model control group were added with DMEM medium containing 5% blank serum, and the other groups were respectively added with DMEM culture fluid containing 5% different time points NMT and each single herb-containing serum. After 12 hours of protection of H2O2, KCL, GLU model and 2 hours of protection of Na2S2O4 model, except for the blank serum control group, the remaining groups respectively were treated with 10 mmol/L Na2S2O4 sugar-free DMEM medium for 4 hours; 100umol/L H2O2 solution for 2h; 125mmol/L KCL solution for 2h ; 25mmol/L GLU solution for 2h, and then changed to normal culture medium and placed in a 37°C, 5% CO2 incubator for 24 hours, take the supernatant of each group for used. LDH leak detection: Take the supernatant of each of the above four models, according to the instructions of the LDH Kit of Nanjing Jiancheng Bioengineering Institute, test the LDH activity in cells and draw the corresponding drug time curve, and measure it in parallel three times . NO content: Take the supernatant of each of the above four models, according to the instructions of the NO Kit of Nanjing Jiancheng Bioengineering Institute, test the NO activity in cells and draw the corresponding drug time curve, and measure it in parallel three times . Data analysis: The experimental data were analyzed with Excel software. The experimental results were expressed as mean ± standard deviation (X̵±S), and the drug-time curves of four kinds of PC12 cell injury models were obtained with the software of Origin 9.0. Data processing of PK and PD: In the early stage, HPLC-MS was used to analyze the NMT-containing sera at the same time point as the cellular pharmacodynamics experiment, and the drug-time curve of 15 components in NMT-containing serum was measured, and the PKSolver software was used to process the drug-time curve. The plasma concentration parameters of each component are shown in Table 1. Table 1: Blood concentration of each ingredient in NMT drug-containing serum at different time points (ng/ml). The efficacy data of the NMT-containing serum obtained above was organized by Excel software to obtain the timedependent change of LDH release and NO content in different injury models of NMT contained serum at different time points. The results are shown in Tables 2 and 3. Table 2: LDH release at different time points. Table 3: NO release at different time points. Model establishment: SVM is a learning method that specializes in finite sample prediction and is suitable for data analysis and relationship description between the complex active ingredients and biological effects of “non-linear, small samples” . Matlab was used to program and optimize the relevant parameters. A nonlinear correlation analysis model was established for the relationship between the LDH release and the NO content of each blood drug component and the four cell injury models. The contribution of each variable to the drug efficacy was calculated. The observation table found that he concentration of LDH and the content of NO in different blood levels of different components and in four different cell injury models are quite different . To comprehensively evaluate the correlation between each component and each efficacy index, and the value of each indicator is normalized using the Mapminmax function . If ω is greater than 0, it means that the variable has a positive effect on the output variable ; if ω is less than 0, it means that the variable has a negative effect on the output variable; if ω is equal to 0, it means that the variable has no effect on the output variable . The results are shown in Figures 1-4 below. LDH is an enzyme that exists in the cytoplasm. The release of LDH is positively correlated with the degree of cell damage. The more LDH is released from the cell supernatant, the more cell damage serious. The LDH side leakage of NMT and each single herb is different, and the drug effect peaks of drug-containing serum at different time points are also different. In the PC12 cell injury model induced by Na2S2O4, NMT drug-containing serum showed a significant effect peak at 0.75h after absorption into the blood, achieving maximum efficacy. At this time, the side leakage of LDH was lower than 0.25h by 140 U/L, and the protective effect was very obvious. After 2 hours, the protective effect decreased significantly. After 6 hours, the efficacy of drug-containing serum disappeared. RR drug-containing serum reached its maximum efficacy at 0.75h, at this time, the side leakage of LDH in cell supernatant was decreased by about 119U/L compared with 0.083h, which had obvious protective effect, but the protective effect gradually weakened and disappeared after 1h; The side leakage of LDH in the PG-containing serum group increased from 0 to 0.083h, indicating that the 0.083h cell injury reached a maximum, there was an effect peak at 0.5h, and the LDH activity decreased by about 111 U/L compared to 0.083h, and the protective effect was obvious. , And there is a strong protection between 0.25~2h, after 2h the protective effect gradually decreased or even disappeared; The drug-containing serum of LC reached its maximum efficacy at 0.5h with a strong protective effect. At this time, the side leakage of LDH decreased by about 98U/L compared with 0.25h, and there was no protection after 1.5h. The RP drug-containing serum had two effect peaks, 0.5h and 2h, respectively. The leakage of LDH decreased by about 48 U/L compared with 0.25 h. leakage of LDH increased rapidly after 2h, indicating the protection of drug-containing serum quickly declined or even disappeared after 2h. Figure 1: Effect of NMT and each herb drug-containing serum on LDH of Na2S2O4 injury at different time points (`x±s,n=6) (a): 0-24h; (b):0-2h. Figure 2: Effect of NMT and each herb drug-containing serum on LDH of H2O2 injury at different time points (`x±s,n=6) (a):0-24h; (b):0-2h. Figure 3: Effect of NMT and each herb drug-containing serum on LDH of KCL injury at different time points (`x±s,n=6) (a):0-24h; (b):0-2h. Figure 4: Effect of NMT and each herb drug-containing serum on LDH of Glu injury at different time points (`x±s, n=6) (a):0-24h; (b):0-2h. Under the H2O2 injury model, it was found that NMT drugcontaining serum had two effect peaks at 0.75h and 2h, and the 0.5h LDH leakage decreased by 37U/L, which had obvious protective effect, and the drug-containing serum protection gradually weakened or even disappeared after 4h; RR drugcontaining serum had two effect peaks at 0.5h and 1.5h. leakage of LDH began to decrease after 0.083h, and LDH activity at 0.5h decreased by 41U/L, reaching the maximum efficacy. the efficacy decreased significantly even disappeared After 4h; In the PG drug -containing serum group, the cell damage was aggravated at 0.083 h, reached the effect peak at 0.75 h, and then the efficacy decreased, and the efficacy disappeared after 1.5 h; In the serum containing LC, the effect peak was reached at 0.5 h, the leakage of LDH was about 35 U/L lower than 0.083 h, and there was a weak protective effect between 0.25h and 1.5 h, and the protective effect was basically disappear 2h later; The RP drug-containing serum group reached the maximum efficacy at 1h, and the drug-containing serum had no protective effect after 2h. Under the KCL injury model, an effect peak was observed at 0.75h in the NMT drug -containing serum group, and the LDH leakage was significantly reduced, and the protective effect of the drug-containing serum was gradually reduced after 6h; The RR-containing serum group had one effect peak at 0.75h. the side leakage of LDH decreased by about 40 U/L compared with 0.083 h, and the protective effect was strong. There was no protective effect after 4 h. The PG drug-containing serum group had the greatest efficacy at 0.75h, but the LDH leakage decreased less, and the protective effect was weak. the protective effect disappeared after 2h; The LC drug-containing serum group reached the maximum efficacy at 0.5h, and the protective effect of drug serum gradually decreased or even disappeared after 0.75h; The RP drug-containing serum group reached the maximum efficacy at 0.5h, and the LDH activity decreased less than that of the RR drug-containing serum group. The protective effect was lower than that of the RR drugcontaining serum, and the protective effect disappeared after 6h. Under the Glu injury model, it was observed that NMT drugcontaining serum contained maximal efficacy at 0.75h, LDH leakage decreased 69U/L, and the protective effect decreased gradually after 6h; RR drug-containing serum group showed effect peak at 0.75h, LDH leakage decreased by about 73U/L compared with 0.083h, and the protective effect gradually decreased or even disappeared after 2h; The PG drug-containing serum group reached the maximum efficacy at 0.75h, LDH leakage decreased less, the protective effect was weak, and the efficacy disappeared after 6h; The LC drug-containing serum group reached maximum efficacy at 1h, LDH leakage decreased less and the protective effect was weak, and the efficacy gradually weakened or even disappeared after 1.5h; There was an effect peak at 0.5h in the RP drug-containing sera group, and the side leakage of LDH was about 63 U/L lower than 0.25h. The protective effect lasted for a long time and still had a weak protective effect at 24 h.
As shown in Figures 5-8, under the Na2S2O4 injury model, NMT drug-containing serum achieved maximum efficacy at 1h, and the NO content was reduced by about 32umol/L compared with 0.025h. The protective effect was very significant. After 8 hours, the drug efficacy of the drug-containing serum tended to be stable, and the duration was longer, and there was still a weak protective effect at 24 h. RR drug-containing serum showed an effect peak at 0.5h. At this time, the NO content was decreased by about 29 μmol/L compared with 0.083h. The protective effect was obvious, and the efficacy after 6h disappeared. In the PG drug -containing serum group, the effect peak was reached at 0.75h, and the decrease of NO content was little. After 4h, there was almost no protective effect and tended to be stable. LC drug-containing serum has two effect peaks at 0.5h and 2h, with weak protective effect and almost no protection after 4h. In the RP drug-containing serum group, the effect peak appeared at 1 h, the protective effect was obvious, and the duration was longer. 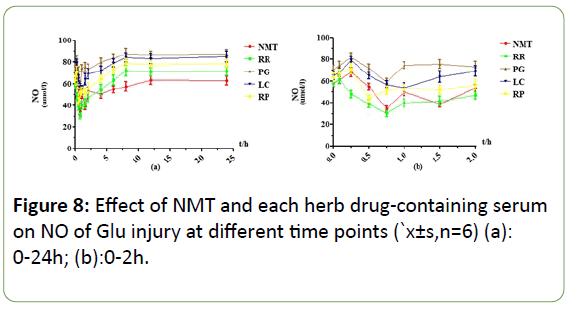 There was still a weak protective effect at 24 h.
Figure 5: Effect of NMT and each herb drug-containing serum on NO of Na2S2O4 injury at different time points (`x±s,n=6) (a): 0-24h; (b):0-2h. Figure 6: Effect of NMT and each herb drug-containing serum on NO of H2O2 injury at different time points (`x±s,n=6) (a):0-24h; (b):0-2h. Figure 7: Effect of NMT and each herb drug-containing serum on NO of KCl injury at different time points (`x±s,n=6) (a):0-24h; (b): 0-2h. Figure 8: Effect of NMT and each herb drug-containing serum on NO of Glu injury at different time points (`x±s,n=6) (a): 0-24h; (b):0-2h. Under the H2O2 injury model, NMT drug -containing serum showed two effect peaks at 0.5h and 2h, and the drug effect was obvious. After 2h, the protective effect of drug-containing serum rapidly decreased and tended to be stable. RR drug-containing serum achieved maximum efficacy at 0.5h and 1.5h, and the content of NO decreased by 33 μmol/L at 0.5h compared with 0.083h. The protective effect was very obvious, and the protective effect was weakened or even disappeared after 4h. PG drug-containing serum group reached the maximum efficacy at 0.5h, when the NO content decreased less than 0.083h about 23 μmol/L, and the drug-containing serum after 4h had no protective effect. The effect peak of LC drug-containing serum appeared at 0.5h, and the decrease of NO content was less than that of other drug-containing serum groups. The protective effect was weak, and the protective effect disappeared after 4h. the effect peak of RP drug-containing serum appeared at 0.75h, and the content of NO decreased by about 20 μmol/L compared with 0.083h. There was no protective effect after 4h. Under the KCl injury model, NMT drug-containing serum reached its maximum efficacy at 1 hour, its protection was very obvious, and its duration was longer, and it still had weak protection effect at 24 hours. RR drug-containing serum showed an effect peak at 0.75h, when the NO content was decreased by about 57 μmol/L compared with 0.083h, there was obvious protective effect, gradually weakened and stabilized after 1.5h, and there was still a weak protective effect at 24h; The effect peak of PG drug-containing serum appeared at 0.75h, the efficacy reached the maximum, NO content decreased less, and the protective effect disappeared after 8h; LC drug-containing serum reached the effect peak at 0.25 h, and the NO content decreased significantly. After 1.5 h, the protective effect gradually decreased and stabilized; RP drug-containing serum reached its maximum efficacy at 0.5 h, but the NO content decreased less, and the protection gradually weakened after 6 h.
Under the Glu injury model, the NMT drug-containing serum had obvious effect peaks at 0.75h and 1.5h, which had a significant protective effect and a long duration. It still had a weak protective effect at 24 h. RR drug-containing serum had a very obvious effect peak at 0.75h, when the NO content was decreased by about 31umol/L compared with 0.083h, the protective effect disappeared after 6h; The PG drug-containing serum reached its maximum efficacy at 0.75h, but the decrease in NO content was less than that of protective effect, and there was no protective effect after 4h. The drug-containing serum of LC had effect peaks at 0.5h, and the NO content decreased greatly. The efficacy disappeared after 6h. RP drug-containing serum had a weaker effect peak at 1h, and the efficacy disappeared after 6h. For the four different damage models, each component has different weight coefficients with LDH release as indicators, showing different positive and negative correlations, as shown in Table 4 below. For the Na2S2O4 model group, except for Chrysophanein, Rb1, and Senkyunolide I, there was a positive correlation between the other components and the efficacy of LDH release. H2O2 induced oxygen free radical damage model, rheochrysidin, Senkyunolide I, chrysophanol, emodin, 3 ́- methoxy puerarin, Rc, Rg1, Rb1 with pharmacodynamics of LDH release as indicators have a positive correlation and the positive correlation decreases in turn. In the KCl-induced calcium overload model, chrysophanol, emodin, 3 ́-methoxy puerarin, ligustilide, Aloe-emodin, rhein, emodin, Rc, Rb3 with pharmacodynamics of LDH release as indicators have a positive correlation and the positive correlation decreases in turn. For Glu-induced glutamate toxicity damage model, rheochrysidin, Chrysophanein, 3 ́-methoxy puerarin, chrysophanol, emodin, rhein, Rg1, ligustilide, Rc with pharmacodynamics of LDH release as indicators have a positive correlation. Table 4: Weighting coefficient w (LDH) for each component and four damage models. For the four different damage models, each component has different weight coefficients with NO release as indicators, showing different positive and negative correlations, as shown in Table 5 below. For the Na2S2O4 model group, expect for Chrysophanein, Senkyunolide I, there was a positive correlation between the other components and the efficacy of the NO content index. The oxygen free radical damage model caused by H2O2, expect for Chrysophanein, Rg1, Rb1, puerarin, 3 ́-methoxy puerarin, and ligustilide, the other components with pharmacodynamics of NO contents as indicators have a positive correlation. In the KCl-induced calcium overload model, except for Chrysophanein, puerarin, daidzein, and ligustilide, the other components with pharmacodynamics of NO contents as indicators have a positive correlation. For the Glu-induced glutamate toxicity injury model, emodin, 3 ́-methoxy puerarin, chrysophanol, rhein, ligustilide, Rg1, Rb1 with pharmacodynamics of NO contents as indicators have a positive correlation and the positive correlation decreases in turn. Table 5: Weighting coefficient w (NO) for each component and four damage models. Ischemic stroke is a common disease with rapid onset, diverse changes, serious illness and high mortality, which is a great hazard to human health. The prevention of stroke has become a common concern. research on drugs for treating stroke has attracted the attention of the scientific community. Therefore, this article establishes commonly used four types of cerebral ischemic in vitro cell injury models, these four in vitro models cover an important four-step response to the cascade of cerebral ischemia, in which the Na2S2O4 model is the initial injury process, while H2O2, KCL, and GLU are the three most serious processes leading to cerebral ischemic injury, consistent with the theory of cerebral ischemic injury. that is, Na2S2O4-induced hypoxia-glucose injury model, H2O2-induced oxygen free radical injury model, KCL-induced calcium overload model, and Glu-induced amino acid toxicity injury model. Taking PC12 cells as the research object, the release amount of LDH and NO content were used as pharmacodynamic indicators. through compared NMT and each single herb drug-time curves of different indicators of the four damage models found that the protective effect of NMT on cerebral ischemic injury caused by the four mechanisms is better than that of the individual herbs, which is in accordance with the characteristics of compound multiple effects and integrity. The effect of each single herb on the four damage mechanisms is different. For example, for Gluinduced cerebral ischemic injury, RP has a greater protective effect and can be considered to increase the proportion of RP in the NMT group when treating cerebral ischemic injury caused by Glu. In the cerebral ischemic injury caused by calcium overload mechanism, the protective effect of LC is larger than that of PG and RP group, and it may be considered that in the treatment of cerebral ischemic injury caused by calcium overload mechanism, the proportion of LC in the compound compatibility can be increased.to achieve rational administration of cerebral ischemic injury caused by different mechanisms. However, in the future research, it is necessary to further investigate the specific composition ratio of NMT in the treatment of cerebral ischemic injury caused by four different injury mechanisms in order to achieve the purpose of clinical rational drug use. The protective effect of each single herb on the four damage mechanisms is in line with the combination rule of NMT. Compound has a significant protective effect on cerebral ischemic injury and is superior to each single drug group. Previous studies have confirmed that emodin, rhein, emodin methyl ether, chrysophanol, daidzein, puerarin, 3 ́-methoxy Puerarin, Re, Rb1, Rg1, Rb3, ligustilide, senkyunolide I, ferulic acid have Significant efficacy against cerebral ischemiareperfusion injury. therefore, according to the previous pharmacokinetic data combined with the pharmacodynamic indicators of this article, based on the SVM algorithm, a PK-PD correlation mathematical model was established to study its pharmacodynamic material basis for the treatment of cerebral ischemic injury. It was found that the drug-containing serum contain schrysophanein, chrysophanol, aloeemodin, chrysophanol, rhein, emodin, Rg1, Rb1, Rb3, Rc, puerarin, daidzein, 3 ́-methoxypuerarin, ligustilide and senkyunolide I have positive correlations in four cell models of cerebral ischemiareperfusion injury, which may be cerebral the main components of the pharmacodynamic effects are exerted, and the positive correlations of the models of cerebral ischemic injury caused by different mechanisms are different. This 15 components in NMT contained drug serum had a certain correlation with the cell injury model induced by the four mechanisms. It may be a medicinal material of NMT, and the different components are responsible for the cerebral ischemic injury caused by different mechanisms. The correlation of the models is also different, indicating that for different mechanisms of cerebral ischemic injury, the efficacy of each component is also different. For Na2S2O4 injury model, the positive and negative correlations of the effects of LDH release and NO content were basically the same for all components. They were basically chrysophanol, Aloe-emodin, rheochrysidin, Rb1, Rc, and 3 ́-methoxy puerarin and ligustilide is greater, suggesting that these components may play a major role in the treatment of brain thrombosis caused by cerebral hypoxia-ischemia. For H2O2-induced oxygen free radical damage models, the contribution of rheochrysidin, chrysophanol, Rc, and 3 ́-methoxy puerarin is basically higher, which suggested that these components may play a major role in the treatment of cerebral ischemia caused by oxygen radical damage. In the KCl-induced calcium overload model, the weighting coefficients of chrysophanol, rheochrysidin, Senkyunolide I, 3 ́-methoxy puerarin, Rg1, Rb1, and Rc are relatively large, indicating that these components may be NMT treatment of major components of cerebral ischemia induced by calcium overload. The amino acid toxicity damage model induced by Glu is basically the contribution of emodin, chrysophanol, 3- ́ methoxy puerarin, rheochrysidin, rhein, Rg1, and ligustilide. The composition may play a major role in the efficacy of NMT in the treatment of cerebral ischemic injury caused by amino acid toxicity. This reveals the pharmacodynamics basis of NMT in treating cerebral ischemia, and provides reference for the clinical rational use of NMT for the treatment of cerebral ischemic injury, and provides guidance for the basic research on the pharmacodynamics of Chinese herbal compound. This also initially reveals the effective material basis of NMT, and also provides reference and basis for the rational use of NMT in the treatment of cerebral ischemic injury. However, the specific pharmacodynamic mechanisms of the four damage mechanisms of the individual monomer components against cerebral ischemic injury remain to be further studied. Ke-ning Li and xu-lei Fan conceived and designed the experiments.Lan-fang Tan conducted the experiments a nd draft the paper. Ke-ning Li, lan-fang Tan, lei Chen and shu-mei Wang conducted part experiments and analyzed the data. All authors revised the paper and approved the final manuscript. This study was supported by grants from the National Natural Science Foundation of China (81274060). 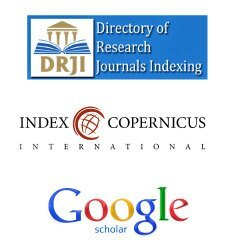 The authors declare that they have no competing and conflicting interests. Zhang R, Zhang H, Zhang Z, Wang T, Niu J, et al. (2012) Neuroprotective effects of pre-treament with l-carnitine and acetyl-l-carnitine on ischemic injury in vivo and in vitro. Int J Mol Sci 13: 2078-90. Fotakis G, Timbrell J A (2006) In vitro cytotoxicity assays: comparison of LDH, neutral red, MTT and protein assay in hepatoma cell lines following exposure to cadmium chloride. Toxicol Lett 160: 171-177. Wang FX, Zhang J, Zhang SP (2011) Effects of nimodipine on the expression of AQP4 around the edema after intracerebral hemorrhage in rats. J Apoplexy Nerv Dis 28: 501-504. Shi YM, Jin-Wen G E, Anatomy DO (2014) Research Progress of Calcium Channels in the Neuron after Cerebral Ischemia/Reperfusion Injury. Medical Recapitulate 2: 2507-2509. Pedata F, Latini S, Pugliese AM, Pepeu G (1993) Investigations into the adenosine outflow from hippocampalslices evoked by ischemia like conditions. J Neurochem 61: 284-289. Jantas-Skotniczna D, Kajta M, Lasoń W (2006) Memantine attenuates staurosporine-inducedactivation of caspase-3 and LDH release in mouse primary neuronal cultures. Brain Res 1069: 145-153. Wilson BC, Connell B, Saleh TM (2006) Relaxin-induced reduction of infarct size in male rats receiving MCAO is dependent on nitric oxide synthesis and notestrogenic mechanisms. Neurosci Lett 393: 160-164. Negishi T, Ishii Y, Kyuwa S, Kuroda Y, Yoshikawa Y (2003) Inhibition of staurosporine-induced neuronal cell death by bisphenol A and nonylphenol in primary cultured rat hippocampal and cortical neurons. Neurosci Lett 353: 99-102. Wink DA, Kasprzak KS, Maragos CM, Elespuru RK, Misra M, et al. (1991) DNA deaminating ability and genotoxicity of nitric oxide and its progenitors. Science 254: 1001-1003. Kara I, Nurten A, Aydin M, Özkök E, Özen I, et al. (2011) Ischemia/reperfusion in rat：Antioxidative effects of enoant on EEG, Oxidative stress and inflammation. Brain Injury 25: 113-126. Chade AR, Lerman A, Lerman LO (2005) Kidney in early atherosclerosis[J]. Hypertension 45: 1042-1049. Lewen A, Matz P, Chan PH (2000) Free radical pathways in CNS injury. J Neurotrauma 17: 871-90. Konoeda F, Shichita T, Yoshida H, Sugiyama Y, Muto G, et al. (2010) Therapeutic effect of IL-12/23 and their signaling pathway blockade on brain ischemia model. Biochem Biophys Res Commun 402: 500. Abedin Vakili, Somye Mojarrad, Maziar Mohammad Akhavan (2011) Pentoxifylline attenuates TNF-[alpha] protein levels and brainedema following temporary focal cerebral ischemia in rats. Brain Res 1377: 119-125. Sairanen TR, Lindsberg PJ, Brenner M, Sirén AL (1997) Global forebrain ischemia results in differenfial Celular expression ofinterleukin and its receptor atmRNA and protein level. J Cereb Blood Flow Metab 17: 1107-1120. Huang X P, Liu X D (2012) Effects of the combination of active component extracts from Astragalus membranaceus and Panax notoginseng on apoptosis, reactive oxygen species and mitochondrial membrane potential of PC12 cells with oxidative injury. Chin J Integr Med 10: 1127-1134. Wood-Kaczmar A, Gandhi S, Yao Z, Abramov AS, Miljan EA, et al. (2008) PINK1 is necessary for long term survival and mitochondrial function in human dopaminergic neurons. PLoS One 3: 2455. Peruche B, Krieglstein J (1991) Neuroblastoma cells for testingneuroprotective effects. J Pharmacol Meth 26: 139. Willcox JM, Summerlee AJ (2014) Relaxin protects astrocytes from hypoxia in vitro. PloS one 9: e90864. Savitz S I, Rosenbaum D M (1998) Apoptosis in neurologicaldisease. Neurosurgery 42:555573. Chun-Yan YA, Ling HE (2008) Neuroprotective effects of sinapine on PC12 cells apoptosis induced by sodium dithionite. Chinese J Natural Medicines 16: 205-209. Radko L, Minta M, Stypuła-Trębas S (2011) Cellular toxicity of malachite green and leucomalachite green evaluated on two rat cell lines by MTT, NRU, LDH, and protein assays. Bulletin Veterinary Institute in Pulawy 55: 347-353. Sierra C, Coca A, Schiffri EL (2011) Vasclar mechanisms in the pathogenesis of stroke. Curr Hypertens Rep 13: 200-207. Qu J, Gao J, Sun J, Zhang L, Makino T, et al. (2012) Pharmacokinetics of conjugated metabolites in rat plasma after oral administration of tectoridin. J Chromatogr B 902: 61-69. Peng B, Zhao P, Lu YP, Chen MM, Sunh et al. (2013) Z-ligustilide activates the Nrf2/HO-1 pathway and protects against cerebral ischemia-reperfusion injury in vivo and in vitro. Brain Res 1520: 168-177. Hu Y, Duan M, Liang S, Wang Y, Feng Y (2015) Senkyunolide I protect rat brain against focal cerebral ischemia-reperfusion injury by up-regulating p-Erk1/2, Nrf2/HO-1 and inhibiting caspase3. Brain Res 16: 39-48. Cheng CY, Su SY, Tang NY, Ho TY, LoWY, et al. (2010) Ferulic acid inhibits nitric oxide-induced apoptosis by enhancing GABA(B1) receptor expression in transient focal cerebral ischemia in rats. Acta Pharmacol Sin 31: 889-899. Li N, Liu B, Dluzen DE, Jin Y (2007) Protective effects of ginsenoside Rg2 against glutamate-induced neurotoxicity in PC12 cells. J Ethnopharmacol 111: 458-63. Liu C S, Chen N H, Zhang J T (2007) Protection of PC12 cells from hydrogen peroxide-induced cytotoxicity by salvianolic acid B, a new compound isolated from Radix Salviae miltiorrhizae. Phytomedicine 14: 492-497. Penugonda S, Mare S, Goldstein G, Banks WA, Ercal N, et al. 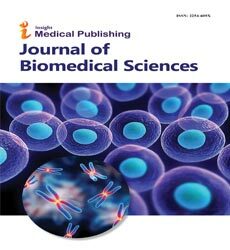 (2005) Effects of N-acetylcysteine amide (NACA), a novel thiol antioxidant against glutamate-induced cytotoxicity in neuronal cell line PC12. Brain res 1056: 132-8. Lu YH, Su MY, Huang HY, Yuan CG (2010) Protective effects of the citrus flavanones to PC12 cells against cytotoxicity induced by hydrogen peroxide. Neurosci Lett 484: 6-11. Sokolova TV, Zakharova IO, Furaev VV, Rychkova MP, Avrova NF (2007) Neuroprotective effect of ganglioside GM1 on the cytotoxic action of hydrogen peroxide and amyloid β-peptide in PC12 cells. Neurochem Res 32: 1302-13013. Ji B S, Gao Y (2008) Protective effect of trihexyphenidyl on hydrogen peroxide-induced oxidative damage in PC12 cells. Neurosci Lett 437:50.